This photo is a detail from a print found in The Amundsen Photographs, edited and introduced by Roland Huntford, © 1987 by Anne-Christine Jacobsen and Roland Huntford, and published in the US by the Atlantic Monthly Press. The tent was fabricated by the expedition sailmaker Martin Rønne (Finn Ronne's father) aboard the Fram. It was cut out on the heaving chart table in the midst of a severe storm. 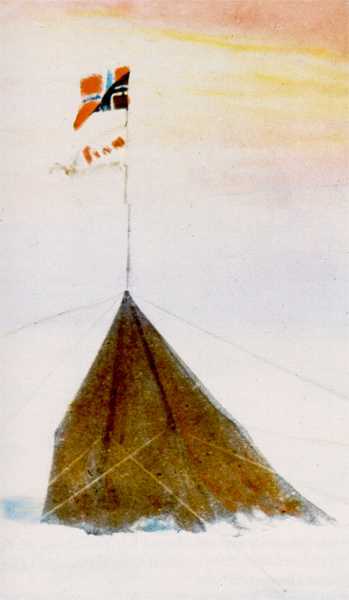 The tent was a special lightweight aerodynamic design, invented by the American polar explorer Dr. Frederick Cook while with Amundsen on the Belgica expedition (the first to winter in Antarctica, in 1898). Roald Amundsen, like most NGO explorers, had to raise lots of money to finance his travels; he toured the world giving lectures and showing hand-colored glass slides. Amundsen almost didn't have any pictures from this trip--his camera was damaged and the film didn't turn out. Fortunately, Olav Bjaaland brought his personal camera along. Later, however, the colored slides were thought to be lost, but a box of these was found in the attic of his nephew's widow in Oslo in 1986, and they formed the basis for this book. I highly recommend this book if you can find it...and thanks to Rob Robbins and Sandra Ackley for the copy they gave to me!